It's kind of inspiring me to muse on phones and phone memories. The days when the arrival of the new phone book was actually pretty cool. When your friends had a "children's line" listed in the book under their parents' main number. 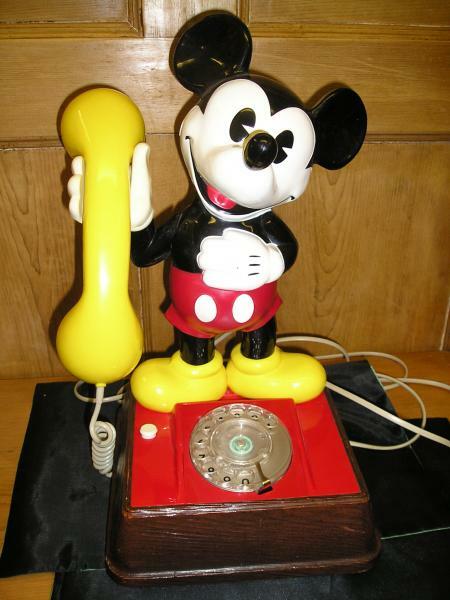 When clunky heavy dial phones slowly gave way to options, like the Mickey Mouse phone. (My parents for some reason chose the old-fashioned candlestick phone, which looked cool but was impossible to do homework on, as you couldn't cradle it under your chin and talk/listen while you wrote notes.) The times when you thought you would absolutely die if he didn't call. The days when push button sloooowly replaced dial calls. (My parents wouldn't go to touch-tone FOREVER, stubborn as they are, because it cost something like $2 more a month or something.) I also had friends who were forever working on their house, and since their kitchen walls weren't finished, their mom let them write the most-called numbers right on the wall next to the phone, which I thought was unbelievably cool. What are your favorite phone memories? I still have an old dial phone in my basement (the beauty of old house wiring, including old phone wiring). And I have two old-style 3-prong phone jacks in the house, too. The dial phone still works, actually better than the cordless phone that I need to replace (again). We had a phone in the garage when I was a teen, and my parents parked their boat in the garage. I would sit in the boat using the phone with the extra long cord for HOURS with my friends. It was fun, for some reason, to sit in a cold (or hot if it was summer) & talk endlessly. When I was a kid, we had a bright red wall phone with a 12-foot cord, and I would talk and pace with that phone for ages. In 2000, my husband and I moved into an older house that had a similar phone, only green, in the kitchen. Just hearing it ring made me smile. We not only had A phone (complete with a telephone bench... remember them?? ), but until the late '70s we were on a party line. If you're under 40 you probably never experienced a true party line, but the idea was that you literally shared a phone line with several other households. So when someone else was on the line, you had to wait your turn. Hilarity ensued when someone on the line would leave their phone off the hook (effectively cutting off the line), pick up the phone quietly and listen in on your conversation, or be a jerk and not hang up even if you had a bona fide emergency. Sometimes you could pick up the phone and have a random conversation with someone, but more often than not the party line was a nuisance. The phone company (back when it was THE phone company) put party lines out of their misery in the early '80s for the most part, though they still exist in rural areas according to Wikipedia (http://en.wikipedia.org/wiki/Party_line_%28telephony%29). Shoot, we even had a party line when I was young. And I think there was still a touch-tone fee when I first left home and got my own in the 80's. Favorite memory? The days long before caller ID, before *69, before most people had an answering machine, when nine-year-old budding sociopaths like myself could prank call with impunity. Calling the Time and Temp. Also calling the "line testing" number that would automatically call your phone a few seconds later to make sure your ringer was working. We would always call the number, then run outside leaving someone to answer the "phantom" caller. When we first got a phone at our lake house, which was kind of isolated, we had a party line. Later, we had our own line, but kept the old standard dial phone, which was good and bad because of the loudness of the ring. Sucked if it rang early in the morning or late at night, but great when you were outside; we just opened the window and ran the phone out onto the deck, you could hear the ring while out by the lake and run pick up!